Hall of Gods gives you the opportunity to travel across the world on an ancient Viking ship, as you explore the forgotten realm of Norse mythology. 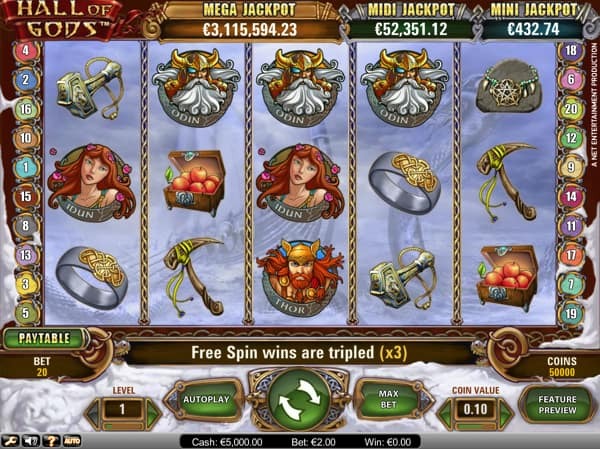 This high-quality and extremely well-designed video slot, developed by Net Entertainment, gives you a sneak preview behind the fascinating world of mythical creatures and Scandinavian Gods. Hall of Gods is presented on 5 magnificent reels with three rows and 20 pay lines. This video slot features some eye-catching symbols along with a captivating storyline, creating a dynamic gaming experience. The bonus features presented in this game include wild symbols, scatter symbols, expanding wilds, a free spin feature, a glorious bonus game, three impressive progressive jackpots and a top paying jackpot bonus worth 4,000 coins in the base game. Regardless of the culture, Norse mythology Gods have always ruled with an iron fist in order to reach the top. Being a ruler is what it’s all about, and the same can be said with the Hall of Gods progressive jackpot. Since its release, the progressive jackpot for the Hall of Gods slot game has been claimed a total of 12 times with an average pay out of £5.5 million. The biggest pay out recorded was £7.8 million in 2015 and its estimated that the progressive jackpot is triggered every 26 weeks. The background takes place on a stormy sea where you will be sailing on a massive Viking ship being attacked by a fearless sea serpent called Jormungand. The pay line numbers are decorated in solid gold rings that are held together by several small chains to add to the look and feel of the game. The beautifully rendered, semi-transparent reels are also separated by thick silver chains while the betting platform gives the impression of being covered in thick white snow. The betting choices displayed underneath the reels are presented in white and green colours, adding a calming effect to your gameplay while the reels are in motion. The background music provides suspenseful drumming music and builds up with every spin, escalating into a rather exciting tune when a winning combination is triggered. All symbols featured in Hall of Gods are embellished with Norse mythology artwork and are intricately rendered with scrolls and knots. There is a total of 10 different symbol designs appearing in Hall of Gods with five high valued symbols and five lower valued symbols. The higher valued symbols are five Norse Gods including Odin, paying the highest jackpot bonus worth 4,000 coins, Thor paying the second highest jackpot bonus in the game, Freya with long golden hair, Loki with blood-red eyes and Idun with beautiful brown hair decorated with pink flowers. The lower valued symbols include an ornate gold and silver ring, Thor’s mighty hammer, a beautiful necklace displayed on a stone, an axe with a lime-green ribbon and a treasure chest filled with red apples. The lower valued symbols pay between 25 coins and 120 coins when five of each are triggered respectively. Before you decide to take on the fearless sea serpent in your mighty Viking ship, you will first need to decide on the betting options provided below the reels. Hall of Gods provides a fantastic array of betting options with five different betting levels featured in the game. The coin values start at a minimum of £0.01 and can be increased to a maximum of £0.50. Therefore, the minimum bet you can place on a single spin begins at £0.20, and for the high rollers out there, you can place a maximum bet of £50.00 on a single spin. Hall of Gods also has an excellent selection of additional features to enhance your gaming experience. The Auto Play feature can provide between 10 and 100 rounds of spins while you sit back and enjoy the action. There’s also advanced auto play settings, used to stop the reels when a winning combination is triggered or when a free spin feature triggers, if a win exceeds a certain amount or when your cash balance decreases to a specific amount. You can also utilize the Max Bet button, located next to the spin button, to avoid going setting the bet levels and coin values to reach the maximum bet. Furthermore, you can disable the music and sound effects by simply clicking on the speaker icon located at the bottom right-hand side of the betting platform. The sea serpent represents the wild symbol and will stand in for all other standard symbols except the hammer and shield bonus symbol and Raven scatter symbol. The wild symbol also expands to fill the entire reel when it makes an appearance on reels two, three, and four, showcasing the full fiery of the sea beast as it rises out of the water. The two ravens resting on a grave in front of a full moon acts as the scatter symbol and triggers the free spin feature available in the game. If you display a winning combination utilising the wild serpent symbol on reels two, three or four, it will expand to fill the entire reel, revealing the full sea serpent and providing more winning opportunities. Displaying three, four or five Raven scatter symbols anywhere in view on the glorious reels, you will be awarded 10, 15 or 20 magnificent free spins respectively. During the free spin round all wins accumulated will be tripled and you stand a chance to re-trigger the free spins round by displaying three more Raven scatter symbols on the reels. The golden hammer and shield icon acts as the bonus symbol and displaying three bonus symbols will trigger the lucrative bonus game. Once the bonus game is triggered, you will be transported to a screen filled with unbroken shields. You will need to smash several shields until three matching prizes are revealed. The prizes can either be coin amounts or one of the progressive jackpots displayed above the reels including the mini jackpot, midi jackpot or mega jackpot. Hall of Gods is a sensational game with plenty of interesting bonus features, high-quality graphics and a captivating storyline to keep you on the edge of your seat with every spin. The game features a low variance with a Return to Player ratio of 95.50%. With a little patience, you can strike it big once a bonus feature is triggered. Hall of Gods is a popular progressive jackpot slot from Net Entertainment. The slot can be played at casinos like LeoVegas Casino, Thrills Casino and Casumo Casino. You can also play a demo version of Hall of Gods for free below.